What’s up? Hoje, no podcast, eu falo sobre dois idioms super comuns na língua inglesa com a palavra scratch… Não perca! What’s up? You’re listening to the new episode of the Inglês Online podcast. Thank you for telling everyone you know about this podcast and, enjoy! So do you know what scratch means? If you feel an itch somewhere in your body, you’re probably going to scratch it. And you know those cards that you get sometimes when you buy something, and there’s this silver-coloured surface and underneath the silver layer there might be a prize for you? So you have to scratch those bits of silver off to see if you’ve won anything. To sum up, think of a dog scratching itself. Dogs do that a lot. I think you get the gist. So here’s sort of a funny expression, if you think about it: do something from scratch. So here’s an example: when you make lasagna from scratch, that means you make the pasta yourself. That’s right: you don’t go to the store and buy the lasagna sheets that have been pre-made and packaged for your convenience. No, you use flour and eggs, and whatever else is needed to make the sheets, and then you make the tomato sauce using the tomatoes you bought at the market and you grind the beef, and then you cook it, and you put it all together to form your beautiful lasagna. That is lasagna that you made from scratch. So when you make food from scratch, for example, that means you, yourself, make the parts that will be used to put together the whole thing. This expression is obviously very common when you’re talking about creating, or building, or making something. Food dishes are a perfect example. Nowadays there’s so much prepared food available, and some of it is really great quality food, that I end up not cooking a whole lot of food from scratch. Other people are more old-fashioned when it comes to food: they like cooking basically everything from scratch. Here’s another example where you can apply this idiom: let’s say you’d like to log your monthly expenses into a spreadsheet to have a better sense of where your money’s going every month. You browse the internet for a few minutes looking for a template for your spreadsheet. Maybe there’s something out there that someone built for that purpose and you could copy it or buy it. After a half hour you realise there’s nothing you like, and you decide to build your spreadsheet from scratch. So you will decide how many columns you’ll use, the formulas, the labels and everything else. You’ll build the spreadsheet from scratch. And here’s another great idiom that you’ll hear a lot – let me start with an example. Let’s say you just took a course on how to cook with chayote. 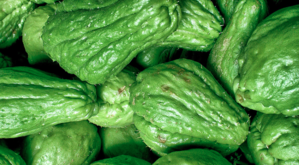 If you don’t know what chayote is, I’ll tell you right now: chuchu. So you took this one-week course that taught you all the culinary secrets you need to create marvellous dishes with chayote. So you’re in market now to buy… chayote, of course, and you bump into your friend Mary, who wants to know all about the chayote secrets. Well, you’re kind of in a rush so you only have time to tell her secrets number one, two and three. Mary is blown away. She says “I never knew there was so much you can do with chayote!” You tell Mary that the two of you should get together so you can further discuss the culinary role of chayote, because secrets one, two and three that you just told her? That’s just scratching the surface of all the possibilities. There’s so much to learn! There are about fifty great tips that you learned that really turned you into a chayote expert. Mary is blown away by the first three secrets! That’s nothing. You’re just scratching the surface. It’s just the beginning. There’s a lot more beneath the surface. The first three tips are just a taste, just an introduction – they’re just scratching the surface of the wealth of knowledge you acquired in your chayote marathon. So tell me: do you usually cook things from scratch? Talk to you next time. Ana, i think there’s a problem in the commentaries on your blog. If you just fill the name and email, it won’t register the comment.. you’ll have to fill all the fields (website and the box to reply when you answer) to work. Thanks for the tip. So far I’ve known the expression “to scratch beneath the surface”= to look further than what’s obvious. but from now on I’ve got the gist of “scratch the surface” = to deal with a small part of te problem. Eg. : In spite of helping refugees, we are hardly scratching the surface of the problem. Como posso ir direto para uma página anterior específica?